16-year old Dorset skidder Anders Rowe has been declared as the fourth rider in the 'Cases' Rebels 2019 team. 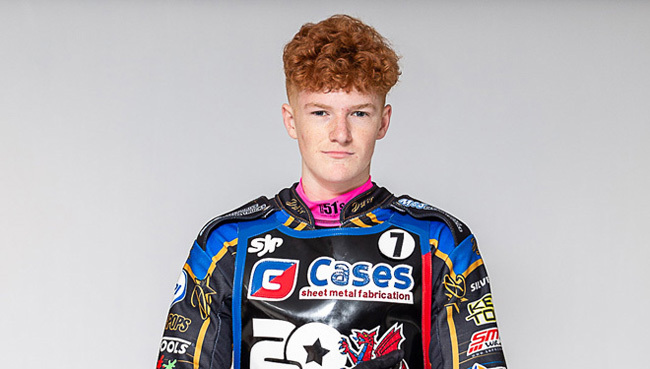 The Weymouth born rider has ridden for Kent in the National League for the past two seasons where he built an average in excess of seven points last season, finished 10th in the British U19 championship at Ipswich and only missed out on qualification to the U21 final by a single point after scoring 8 in his semi-final at Birmingham. His inclusion in the Rebels side will pitch him in the reserves berth and co-promoter Garry May is looking forward to see him try and develop in that role. "With only a 38 point limit to work with this year most teams will be setting their stalls out with youngsters at reserve and that should make it fascinating to see how Anders adapts in his first season in the Championship. He is really keen to come and being a fairly local lad as he lives in Swindon, hopefully that will attract a bit of interest too." Rowe joins Rory Schlein, Chris Harris and Nico Covatti as confirmed starters for the Rebels 20th Anniversary season with Garry May confirming that the contracts have been offered to fill the remaining three berths.